Rather than repeating myself every time, I’ll just post a straight link – I’ve written a new “article” (rather, apology and statement of intent) to A Year of Frugal Gaming. My gaming has been suffering recently. I’ve definitely been on target with “spend less” – although the temptation to grab a new rulebook or two has been pretty strong, I’ve managed to avoid it. Unfortunately, real life has been getting in the way of getting any actual gaming done – I’m busy, my gaming group is busy, no-one ever lines up a day together. I have, however, used a few days off of work to get ahead on my Dark Elf painting. The particular style of batch-painting that I favour is ‘do every model at once’, meaning that my current batch is about 60 Corsairs. The downside to this is that until you pick up a model and examine it, as I did this week, it becomes difficult to work out how far away you are from completing. I’m just about entering the final detail stage, which for me means that I’ll be dividing models up into groups of ‘haves’ and ‘have-nots’ for particular things. The first will probably be gemstones – every model with a gemstone goes in one group, which becomes a small batch for painting. When that’s finished, I’ll go through the batch checking out models to see if they need anything else done – belts, buckles, whatever. If they don’t, then I can actually call that model finished! So for me, entering this ending stage is very exciting, because the psychological obstacle of having sixty scowling warriors staring at you on a painting table makes the sense of achievement that much greater. And the increased sense of achievement will make me want to play more, meaning it’ll be more likely that I manage to organise a game! Another thing I was doing with my free time was planning a role-play campaign. I’ve got a rough skeleton story sketched out, I just need to flesh and structure it a bit more and see what it becomes. My gaming group also have a role-play campaign going that was geographically inaccessible to me, but has fortunately moved closer, that I’m now invited to. That’s a weekly affair that will score many many points on the ‘play more’ part of the deal, and possibly save me the trouble of buying new rulebooks – role-play groups are great for borrowing and sharing books, or buying second-hand. That should also help nip the temptation to spend in the bud. I think role-playing games are one of the best kinds of games for a frugal and/or social gamer – you might well buy a few expensive rulebooks, but you can bet that someone else in the group has done the same and that becomes a pooled resource. To get started, all you need is to borrow some dice (or still rather frugally, buy your own set for a few pounds) and there you go! I’d heard somewhere that they first took off in popularity around the time of a recession, where people were watching their spending and to have a game based almost solely in imagination was a very frugal way of enjoying yourself – it may not be true, but it sounds plausible! So to recap, I’ve had a lousy time of not playing enough games. Real life has been interfering, preventing the planning of games nights (for my board games fix) and regular wargaming opponents. But it looks like regular gaming is getting back on the agenda, and if there’s one thing that I’ve learned from my new year’s resolution experiment, it’s that having a real plan of action (not just a hopeful goal) will make all the difference. So you can expect next year’s plans to be much more solid! I’ll cut past the ‘hello, is this thing on’ and just straight up apologise – Sorry I’ve not written anything here for a while. Today, I’ll be blaming this on two things. Firstly, I’ve managed to accidentally nuke a few draft posts that were ‘in process’ – this was pretty stupid. Secondly, I’ve been failing in my mission. Or at least half failing, but failing in the fun half. Succeeding in the dull half is not really succeeding at all. The mission is ‘Play More, Spend Less’. And I’ve been hardly playing at all. A couple of games of Warhammer Invasion when I can squeeze them in, and a short RuneQuest campaign I participated in. Though I’ve tried to plan a games evening (I have held one of the four I intended to by this time in the year), I’m trying to use it to get people round to visit who don’t normally come – so this too, is failing. I can blame a lot of things (increased demands on time, trying to make one games night do multiple things, etc etc) but ultimately, it’s down to me not setting aside time to play games. I have managed to save money by not buying new things – indeed, selling off all of my old Star Trek CCG cards has allowed me to grab a new television – but that’s not exactly fun. It’s nice, once I got past the hoarder’s natural instinct of “But that’s my stuff!” but it’s not exactly fun. Certainly not as fun as playing games, which is why we’re all here. This hit me like a brick. For one thing, it’s a really nice rulebook. Heavy, hardcover, bionics and spaceship battles. What more could you want? Well, the time to play it, obviously, and the blessing of She Who Must Be Obeyed. It was at that moment that I realised that spending less on games was the trivial part of the frugal gamer’s mission – the gaming more part was actually, counter-intuitively, the harder part! Despite the busy social schedule for the next couple of months, I’m going to try to remedy this by scheduling some roleplaying games in to kick life back into a long-left WFRP game. I’ll also try to sneak some zombie-themed games into a zombie-themed movie evening (to celebrate the new telly). Hopefully, between planning games, playing games, and the other commitments which prevent the other two I’ll have some time to at least write some game reviews to put up here. Wish me luck! 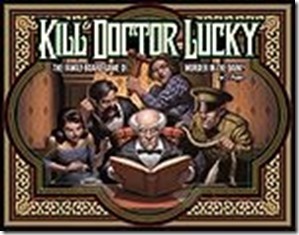 Kill Doctor Lucky is a board game, the spiritual prequel to Cluedo. Instead of stalking around a mansion trying to work out who did it, you’re stalking around the mansion trying to do it. The way to win the game is relatively simple – get yourself in the same room as Dr Lucky, make sure no-one can see you, and try to do him in with whatever weapons you may have picked up (or your bare hands). Other players then take it in turns to play failure cards to try and thwart your attempt. If you succeed, you win! If you fail, you get a spite token – which, for as long as you hold it, increases your chances of success. The rules themselves are easy to pick up, and the game has become a staple in our games nights for being quick to learn, quick to play, ruthlessly mercenary and with a splash of gambling too. “Should I play this failure card to stop Ann, or should I refuse and make Carl use his cards… ensuring that my own murder attempt will be more likely to succeed!” This does, of course, backfire occasionally – we’ve had more than one game end early due to over-ambitious would-be-killers. The game has nice, black humour and each failure card includes a reason for the failure – “The doctor spins around and waxes lyrical on his recent polar adventure.” The weapons in the game are also good – a monkey hand (bonus in the lobby), ‘loud noise’ (bonus in the carriage house, picture of a French horn) and killing joke are all in there, as well as simpler ones (revolver, knife, etc). Besides, competing to murder someone is a fairly funny thing to do when you’ve got a bunch of friends, a glass of wine and some takeaway pizza. We picked up the reprint of the game in full technicolour glory, nice wooden playing pieces and big box. Originally, it was released by Cheapass Games in much less glamorous style. Cheapass Games are a frugal gamer’s friend – they believe that all you need to play a game is the rules and any unique components (such as cards). Everyone has dice, false money, pawns and counters so there’s no need to pack all that stuff in a big box and hike the price up. They argue that the quality of those components is generally poor anyway, so it’s better to leave them out, keep the cost down, and allow people to invest in one really good set of gaming accessories to use for all their games. Of course, since the big games companies are unlikely to follow this pattern, the only games you’ll really get good use out of this philosophy are other Cheapass Games. The big box version is good quality, but possibly a little over-priced looking at the content alone, and I believe that the Cheapass printing is no longer available. There are also expansions to the game that introduce the Doctor’s dog, and a prequel game still sold by Cheapass Games called Save Doctor Lucky – wherein you must stop the Doctor drowning on the Titanic (making sure people do see you save him!) The game is slightly harder, since the Titanic is sinking while you play, and there is the potential for nobody to win! Overall, I would heavily recommend this game – even the more expensive big box version – because it is quick to learn, doesn’t seem to get old, provides a lot of potential strategy or luck, and appeals to a wide range of people. I have even had to consider banning it, because about half the time in any games night we hold is spent playing Kill Doctor Lucky – and it usually comes out again for rematches the following day too! Originally posted on A Year of Frugal Gaming. 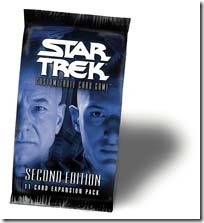 Back in the day, when I was a fledgling gamer, I picked up a box of Star Trek: The Next Generation Customisable Card Game. This was dangerous. I’d never heard of Magic: The Gathering, or any other CCG, at this time, and I thought it would be a fun game to play with my cousins. Some years later, and many more expansion packs down the line, we’d still not completed a single set. For those who are not in ‘the know’ – a CCG is a Collectable or Customisable Card Game. You buy packs of cards with a random contents, and use these to construct a deck. Your opponent will choose his own cards. In theory, this is a gaming heaven – it allows for endless variation in games, as you each have different cards to choose from, and can combine useful cards together to make powerful strategies. Unfortunately, not all cards are created equally. Some cards, you will have a dozen copies of. Others, you may never ever see. The only ‘complete’ sets I ever managed to get were ones I bought on eBay, ready-collected. This randomness can also cause problems in tournaments. Star Trek CCG remains the only game that I have played in a tournament – a monthly affair run by a Friendly Local Game Store that may not even exist now. It certainly hasn’t run ST:CCG tournaments in a long time. Because you need lots of money to ensure you get more different cards (and piles of duplicates stacked up beside it), you’ll be in a better position than someone who has a limited disposable income. For this reason, I would name any CCG with the standard randomisation model as an enemy of the Frugal Gamer. On the other hand, there is a variation on the CCG that seems to bring all the benefits, but designed for a Frugal Gamer. It is the Living Card Game, as developed by Fantasy Flight Games, and works differently. When you buy an expansion for an LCG, you get all the cards in that expansion. They come in different quantities, but these are set and not random. If you buy one of every pack, you’ll have one of every card in the game. The plus-point of the basic CCG – the Customisable point – is still present, in that you tailor a deck out of the cards you have available. There’s no scrounging around for that one rare card that might or might not be in the pack you’ve just bought, you can guarantee that the box you buy has the card you want. 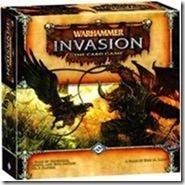 Personally, I’ve been experimenting with Warhammer Invasion: The Card Game from FFG. I would definitely recommend the core game, although it obviously has extra appeal to those familiar with the Warhammer world. It can be played in about an hour, but the draft format rules can easily take as much time as the rest of the game (if you’re an indecisive person, especially). These are not necessary to the game itself, only if you want to introduce a semi-random deck construction into your games. There is a balance involved in defending each of your zones, generating resources and drawing cards, and attacking your opponent. Getting that balance while being attacked yourself is a fun part of the game. The basic setup of the game allows for lots of variation – even using the same decks over and over, I’ve found very different tactics for each side depending on which cards are drawn. Each different faction has it’s own flavour, and can be mixed along the broad ideological lines of the Warhammer world (Order vs. Destruction) to open up the options even further. The rules are quite simple, and can be taught to new players fairly quickly. Working out how to best use their cards may take a while longer, but that’s a matter of practice with any new game. I have found that some of the rules didn’t quite fit at first, compared to games I am used to. The method of assigning damage, then taking actions, and finally applying the damage can open up a range of new, devious tactics but it also takes some getting used to. In the same vein, I have made assumptions about how some cards work and been quite wrong. The best example is that if something says ‘Destroy all units’ it means to destroy all units, for all players. As far as memorable moments go, a few nights ago my wife was ready to destroy me with two Great Unclean Ones when I decided it was the perfect time for a ‘Destroy all units’ card – the board was effectively reset, and I just had to deal out damage before she finished me off. That one card saved me, and gave me a victory! Before that, I’d never been sure about cards that wipe out your own forces. The quality of the components is very high – it might seem slightly pedantic to notice this, but even the damage/resource markers are sturdy, thick pieces that look like they’ll last a while. The cards themselves are printed right out to the edges, with no borders, and this looks much better than other systems with a border – in the case of my first CCG, Star Trek, sometimes the borders were of different colours for collector’s sakes! My gripe would be, however, that the core game doesn’t offer enough in the way of effective themes beyond the main factions. There’s no real purpose to adding Chaos cards to an Orc deck, they would only interfere with each other’s themes. Dwarfs and High Elves will go together slightly better, with one healing units and the other healing your zones, but it’s a fairly weak mix (there are few Elf cards in the core game, let alone those on the theme). The expansions add to the mix, expand the themes, and offer more options but the rub there is that although the first themed expansion set (‘The Corruption Cycle’) adds the Skaven as a sub-faction, it does so spread across all six expansions in the set. As each expansion costs between £5 and £8 (depending on where you find them), to get a full range of Skaven cards – each of which assists the others with thematic synergy – will set you back a fair bit of money. For serious tournament players, you may need to triple the cost to get the maximum number of cards, but I think of serious tournament players as being less than frugal in games of this sort. The best bet for regular gamers who want to compete at that level is to share with your friends and enter with two different decks. Quick note: Fantasy Flight Games are revising their expansion format, so they cost a little more and contain three copies of each card – which eliminates the need for multiple purchases, and works out at the same or less per card. This won’t take effect till later this year, and won’t be back-dated to the packs already released. Overall, I think the Living Card Game format is a very welcome successor to the original CCG format and although I’ve griped about the overall cost of a linked expansion set, you still get significantly more cards for the same money as a CCG set – and with less risk in the purchase, too. In this particular case, the game is quick, fun, easy to learn and has enough variety in the core box to keep you playing for a while. Also, while it describes itself as a two-player game and has no specific rules for multiplayer variants, several cards say ‘one target opponent’ and ‘each opponent’ so I believe it wouldn’t be hard to play a multiplayer game and move the options out even further. Since you can choose your level of involvement as it comes to expansion packs, I’d call this a good game and a frugal pick! I’ve just put my first post up at A Year of Frugal Gaming.